Mary Annette Beauchamp, known to us today as the writer ‘Elizabeth’ von Arnim, was born in Sydney, Australia on 31 August 1866. The exact location of her birth is uncertain, but we can safely assume that at the time her family was living in a prestigious home on Kirribilli Point, Sydney. Her father, Henry Heron Beauchamp, had been born in London into an artistic and cultured family. He was the first of his surviving brothers to migrate to Australia, where he made his fortune in Sydney as a shipping merchant. Two of his younger brothers, Craddock and Arthur, having begun their adventures in Melbourne, moved on to New Zealand. Unlike Henry, they did not make their fortunes; this was left to Arthur’s son Harold Beauchamp (later Sir Harold) whose daughter Kathleen (born 1888) later became well known as the writer Katherine Mansfield. In 1855, Henry Heron Beauchamp married the beautiful young Elizabeth Weiss (Louey) Lassetter. Louey was also of British extraction but was born in Australia. In 1870, Henry Heron and Louey decided to follow Louey’s wealthy brother Frederick Lassetter to live in London where opportunities for culture and education would benefit the growing family. Their youngest child Mary Annette, later to be known as ‘Elizabeth’, was only three years old when she, her four older brothers and sister, left Sydney and sailed to London with their parents. She was never to return to the place of her birth. The Lassetter and Beauchamp families were keen to spend time looking round Europe; it was not long before they left London to take up residence for a couple of years on the shores of Lake Geneva in Lausanne, Switzerland. The beauty of the place, and especially its mountain meadows in springtime, made a lasting impression on their youngest daughter. However, once back in London her schooling began in earnest. An intelligent and musically gifted child, she was able to develop her talents by studying at the Royal College of Music, where her principal study was the organ. Her famous teacher, Sir Walter Parratt, had a lasting influence on her intellectual and musical development; soon she was considering a career as a professional musician. However, her parents were concerned that, at the age of twenty-two, their petite and beautiful daughter’s marital chances were rapidly diminishing. A tour of Europe was therefore organised, with the aim of finding her a suitable husband. This was to have consequences far exceeding their expectations. While staying in Rome, she met the newly widowed Graf Henning von Arnim-Schlagenthin, a member of the Prussian aristocracy and a friend of the Wagner family. He was captivated by the talented, charming and vivacious young woman, and so impressed by her organ playing that he whisked her off, in the company of her parents, to Bayreuth to be introduced to the heart of Prussian society, and to perform Bach and Liszt on the organ before Liszt’s daughter, Cosima Wagner. Two years later, in February 1891, the couple were married in London. Thus Mary Annette Beauchamp became Mary, the Gräfin von Arnim. By now fluent in German as well as French, she began life as a member of the Prussian aristocracy in Berlin. Three daughters were born in quick succession. However, her future was changed for ever during a visit to the Count von Arnim’s country estate at Nassenheide in the spring of 1896. She decided immediately that she would live there with her growing family. She had arrived in her German Garden; ‘Elizabeth’ beckoned. It was in this guise that she wrote her first novel, Elizabeth and Her German Garden. This was published by Macmillan in 1898 and became an instant best-seller, making her a fortune. Over the years, she developed her literary career, going on to complete twenty further highly successful novels. As ‘Elizabeth’, she established an international literary reputation. Her works were usually published with the phrase ‘by the author of Elizabeth and her German Garden’ as the only a guide to their authorship. The pseudonym Alice Cholmondeley was used for the novel Christine. Thus ‘Elizabeth’ became the name by which she was known to the reading public, her friends and even most of her family. Her best-loved novel today is perhaps The Enchanted April (1922), which was filmed first by Harry Beaumont in 1935 and more recently by Mike Newell in 1992. Other novels have also been dramatized; all deserve our attention, notably Vera (1921) and Mr Skeffington (1940). On the death of the Count von Arnim in 1910, she and her five children (including the Count’s longed-for son) left Prussia. She divided her time between various London addresses and her main base, her Chalet Soleil (built in 1911/12) in Montana (now Crans Montana), Switzerland. Her friends included many literary and intellectual figures of the day; two of these were former tutors at Nassenheide, E M Forster and Hugh Walpole. H G Wells stayed with her at the chalet before WW1; their relationship, turbulent at first, turned into a lifelong friendship. Her chalet was also the home to which she transferred her valuable property, including a vast library of books, from Nassenheide. As soon as possible after the outbreak of war in 1914, Mary Annette (Elizabeth) von Arnim became naturalized as a British citizen. 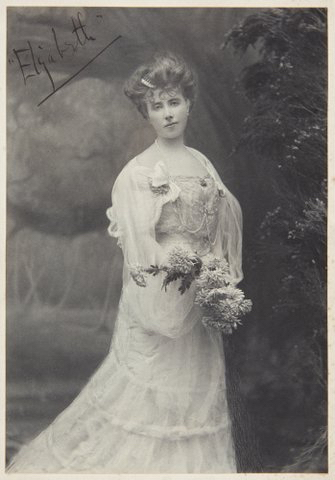 In 1916, she married Earl Francis Russell, older brother of Bertrand Russell, becoming the Countess Russell. The marriage was a disaster and the couple separated three years later. However, they never divorced and she was known as Elizabeth, the Countess Russell, for the rest of her life. The war years saw the deaths of several close friends and family members, including her youngest daughter Felicitas, who died in Germany aged 16. In the early 1920s, ‘Elizabeth’ was able to return to her chalet where she found pleasure in the company of her younger cousin, Katherine Mansfield (1888 – 1923), who was staying in Montana for health reasons. The Chalet Soleil also became the background for Elizabeth’s romantic relationship with the young Alexander Stuart Frere-Reeves (later president of Heinemann), who went there initially to catalogue her vast and growing book collection. In 1930, seeking a warmer climate, she made her home at the Mas des Roses in Mougins, France, where she lived for nine years. There, she created a wonderful garden, took delight in her many dogs and entertained friends and family. Her collection of books was transferred from her chalet to the Mas des Roses, where she added to it on a regular basis. The threat of war in the 1939 forced her to flee to the United States of America, where two of her daughters and son were living. It was a cause of some anguish that her third daughter, Beatrix von Hirschberg, had to remain in Germany. While she was in the United States, the publication of her acclaimed last novel, Mr Skeffington, made her enormously popular with the American public. However, although supported by her devoted second daughter Liebet (Elizabeth von Arnim) and her close friends, the publisher Nelson Doubleday and his wife, Elizabeth’s fragile health suffered during her itinerant life in the United States. She died in South Carolina, early in 1941. After the end of the Second World War, her ashes, in accordance with her wishes, were taken by Liebet to be interred with those of her brother, Sir Sydney Beauchamp, in the small churchyard of St Margaret’s Church, Tyler’s Green, Buckinghamshire, England. While in Europe after the war, Liebet was able to arrange for some of the contents of the Mas des Roses, including hundreds of books, to be distributed among Elizabeth’s heirs in the United States, England and elsewhere. Some books were eventually sold, but many are now housed in the Huntington Library (San Marino, California), where their catalogue can be viewed online. Other books from Elizabeth’s collection remained in France. They are now housed in the library collections of the University of Toulon whose catalogue can also be viewed online. The first biography of Elizabeth, Elizabeth of the German Garden, by Leslie de Charms (Liebet’s pseudonym), was published in 1958.